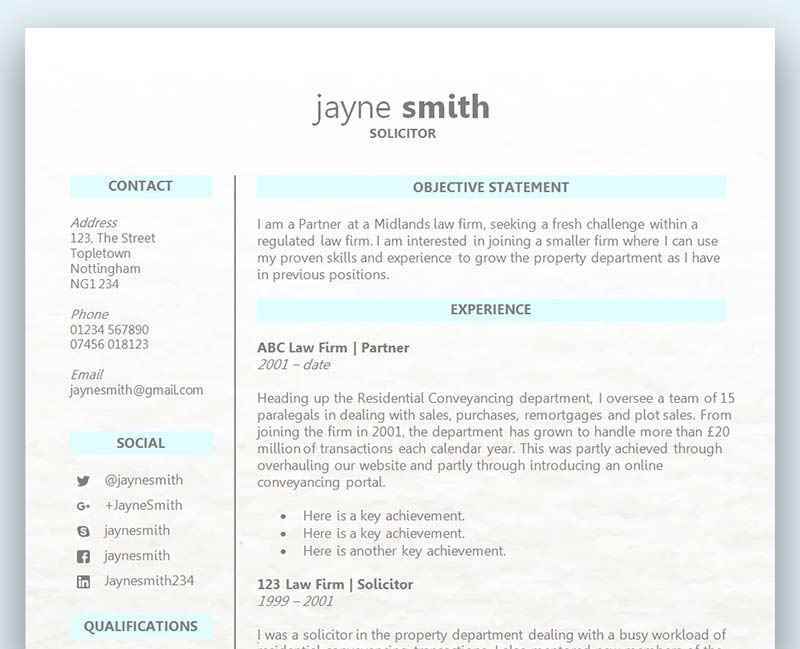 This fresh bright CV template includes a bold title and uses simple icons alongside each segment to help clearly separate your information. The template is different from a standard CV in that it prioritises your information, such as your career objectives, above your contact info. It uses the Impact font (download link below). One page apple green themed creative CV template with boxes and themed icons	Overall rating:	4	out of 5 based on 5	reviews. A fresh, eye catching CV template in a delicious shade of apple green, perfect for drawing attention to your job application. The template can be fully customised in Microsoft Word and is available for download without the need for registration. Now that you’ve left education and you are seeking your first job, it can of course be very daunting trying to figure out how to create a CV that has enough content not to look too bare. All that hard work to gain some qualifications shouldn’t be just used under the ‘qualifications’ section of your CV. It can also be a great way to not only fill out your work experience but to also show initiative. Let’s face it, we all have to start somewhere, and although we know it might take a few years to become CEO we of course have to start with a fairly bare CV with the hope of gaining an interview and a foot in the door. So rather than panicking over what you can include for work experience, why not consider using your school projects. If you took part in a presentation, a meeting, a business project, etc. Then why not use this for work experience. It’s not as if the recruitment manager is going to read it and say, ‘Hey! This isn’t real work’. Instead what they will do is realise that you’ve used your initiative. The recruitment manager will get a lot of CV’s stating qualifications, but if you are the one of few that actually delves more into what you actually did during your education. What you achieved, what you worked on, and your results, are all great sources of information. Sure, you don’t need to worry too much about putting down your paper round, however you might be surprised at how much you’ve done so far. If you had/have a part time job as a waiter or waitress, then this should go down on your CV. Someone who works a part time job whilst studying is someone that is clearly happy to work long hours. If your future boss can see how hard you’ve worked over the past few years, you are one step closer to getting an interview. Other great jobs that people forget to put down (because it isn’t paid) is voluntary work. Working for a charity or volunteering at your local country park shows once again how hard working you are – especially when you didn’t get paid! Can you imagine how good that looks to the hiring manager when he reads that you gave up your time to work for free for a great cause. The hobbies and interest section is often overlooked and not considered as important. However, this is 100% untrue and what you do in your spare time is vital if you want to get ahead of the competition – especially if you are up against experienced applicants or other school leavers. Don’t fall into the trap that most people do by stating things like ‘I like to socialise on the weekend’. This just isn’t good enough to put down any more, and no matter how true it is you need to showcase yourself much more if you want to get an interview. Remember, the employer has never met you and they want to build up a picture of you through reading your CV. Does this person seem hard working? Are they skilled and qualified for the job? Would they fit in and get along with the rest of the team? In order to help them see what type of person you are, use the hobbies section to shine. Write about the things in life that you are passionate about. For example, building model aeroplanes, practicing magic tricks, creating websites (provide links), writing songs, playing in a band, etc.